Joan Collins. Having been acting since the 1950s, I figured she must be getting on a bit – but my jaw definitely dropped a bit when I realised she was 81. Eighty one years old! And still utterly gorgeous and glamourous. Sure, she’s inevitably got a face full of Botox but hey, that’s Hollywood for you – and she certainly doesn’t look horribly plastic. Probably best known for her role as Alexis in 1980s series Dynasty, my personal favourite Joan Collins role is undoubtedly Mrs Potiphar in the 1999 straight-to-DVD adaption of Joseph and the Amazing Technicolour Dreamcoat. Shut up, it’s my favourite musical – and she is an utter fox in that get up! Anyway; many celebrities have released beauty ranges over the years, but today I want to talk about Joan Collins Timeless Beauty. Joan Collins probably wouldn’t be the first person who popped into your head if you were asked which actress has recently created a beauty range, but if you think about it for a minute it really does make sense. Joan has always applied her own makeup for film, TV and photo shoots throughout her career, so I think it’s safe to call her something of an authority on beauty. 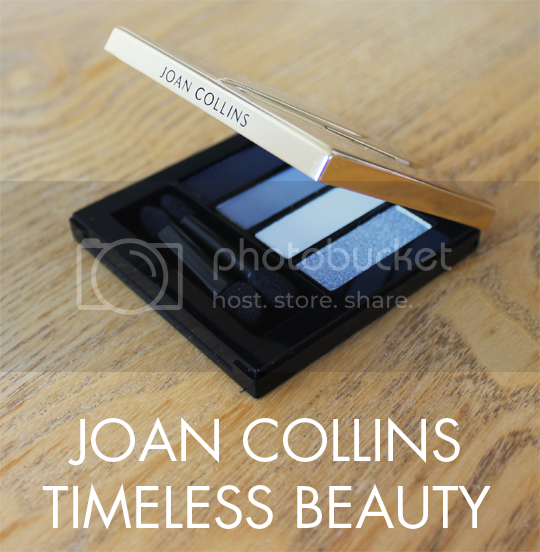 And, unlike many celebrity makeup ranges, Joan has been really closely involved with the creation and design of the Timeless Beauty products. “Beauty is not just for the young. I believe with a little care and attention any woman can look good through her 40s, 50s, 70s and beyond. Looking good and feeling great is the right of every woman no matter how old she is. Beauty is timeless”. Well said, Joan. While the majority of Timeless Beauty is probably best suited to ladies on the more mature end of the scale, that doesn’t mean there aren’t some gems in my twenty-two year old eyes. Although some of us are young enough to be her granddaughter, it’d frankly be a crime to overlook some of these pieces. 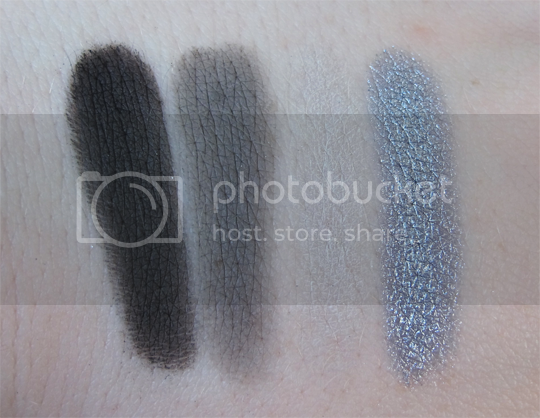 One example in particular is the Eyeshadow Quad in Misty Blacks and Grey*. 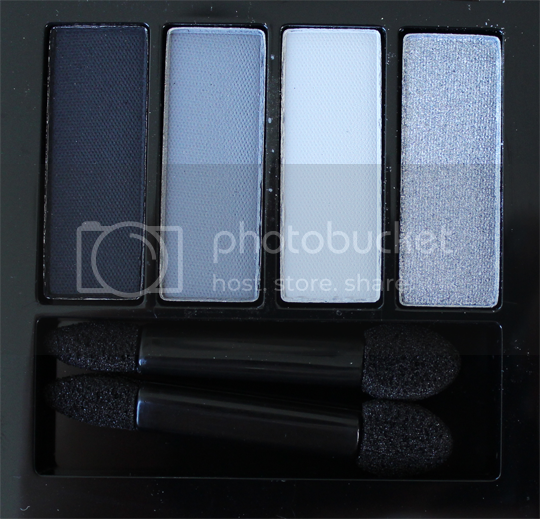 This compact quartet of monochrome shades is the classic colour combination for a timeless smoky eye – something which suits absolutely everyone regardless of age, skintone or personal style and a technique which should be mastered by all at some point in their lives. The quality of these eyeshadows surpasses even that of many high end brands I’ve tried, it really is something. Smooth, soft, easy to blend and chock full of kickass colour payoff without so much as a hint of fallout. In my swatch, the light grey shade second from right doesn’t look like much but the colour just camouflages itself against my dull skintone – and in fact makes a rather lovely brow highlight. The metallic silver is the real star of the show if you ask me. I’d go so far as to say this is the best silver eyeshadow I’ve ever tried. And I must have owned well over a thousand eyeshadows in the last few years, so that’s quite a statement. 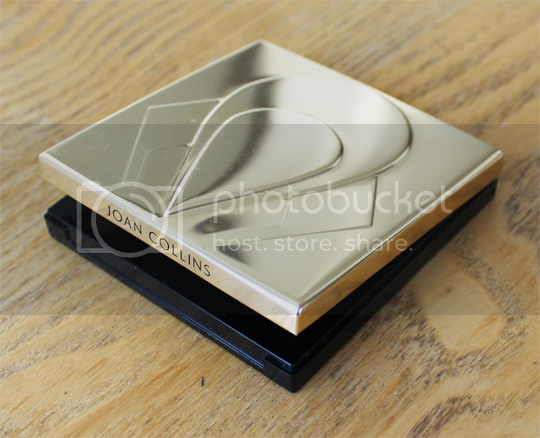 The Eyeshadow Quad – and its golden brown counterpart – costs £25 which I think is perfectly reasonable for high quality. Alongside the eyeshadows there are also a bevy of base products, lashings of lip colours, swathes of skincare and then some. It’s quite the comprehensive range, which you can browse here and you can also shop it on QVC. Are you a Joan Collins fan? Would you consider trying anything from her collection?